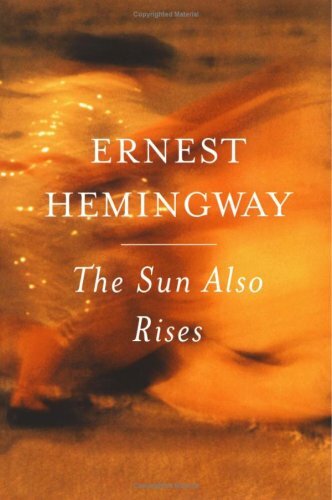 I last read this classic Hemingway book back in high school, along with The Great Gatsby, for a project on the Lost Generation. All I remembered about it was a bunch of American expatriates in Europe, getting drunk and going to bull fights. But surely there was more to it than that. High school was a long time ago. Last week I read it again for a booktalk at work and was surprised to find that I really wasn't forgetting much. The Sun Also Rises is short on plot, but long on hedonism and feelings of disillusionment. The narrator is Jake Barnes, injured in World War I, now drifting aimlessly around Europe. He is joined by other friends, most notably Lady Brett Ashley, not yet divorced but already being fought over by two of Jake's friends before she runs off with a bullfighter named Pedro Romero who is much too young for her. Hemingway's style is not for everyone. He writes in a series of short, declarative sentences. I did this, then I did something else, then I went here, then I bought two more bottles of wine, etc. There is little description or emotional depth and though his style isn't my favorite, I at least find it easy to read. And there were a few moments with just enough description to convey the wonderful feeling of, for instance, lunch on a sunny day outside in an old European city. It's hard to feel bad for these disillusioned folks, as unhappy as they are. Although they frequently complain about not having enough money, they seem to manage ok considering that none of them seem to have jobs. (A couple are writers, but don't seem to ever be writing.) They manage to pay for the hotels they stay in, the food they eat, the bullfights, and the copious amounts of alcohol they consume. Perhaps when I was in high school I was convinced that if I played my cards right, this could be my life. Of course it's not the 1920s and my life isn't a work of fiction, so now it all seems rather unreal. It's always interesting to read a book I last read so many years ago, and it was an interesting little trip down memory lane. If I had to read more Hemingway it wouldn't be a terrible thing, but I probably won't make a point of it.